I am no stranger to calamity. Just yesterday, I managed to start my day by getting trapped in the refrigerator case of a gas station. I went to grab a milk from a refrigerated shelf that was set back from the door by a yard or two, and by the time the plastic bottle of skim was in my grip, I jumped at the quick THUD! of the door slamming behind me. It was a whole ten minutes of heart racing, fists pounding, yelling and some very awkward jumping jack-like motions before a very confused man finally caught sight of my wild gesticulations and rescued me. I don't blame him; I looked like Ralphie's little brother Randy from the Christmas story trapped in a giant coat, only with a backpack on, jumping up and down next to a shelving unit of soda in a gas station refrigerator case. To recover, I ate my feelings at work in the form of a Guinness budino. But, on my way home, something drew me to the grocery store. I beelined straight to the cheese section. 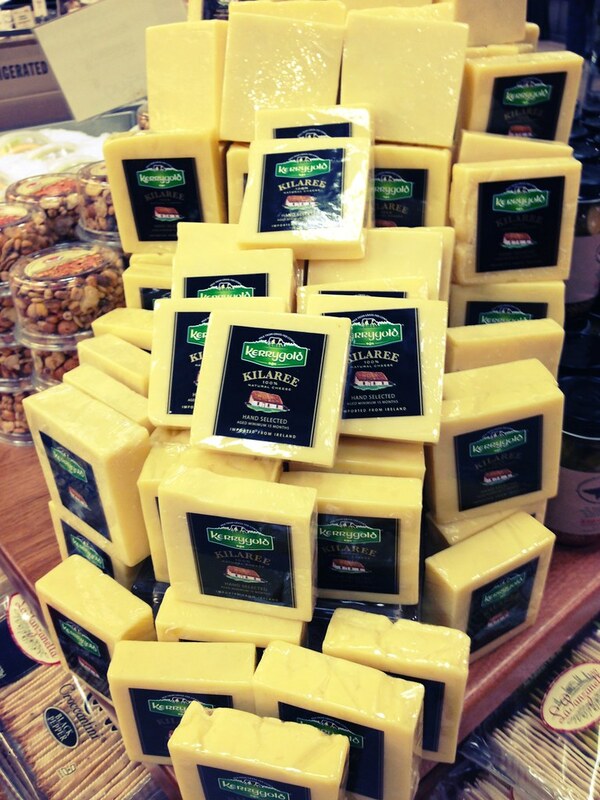 The Kerrygold Dubliner stood before me like a tower of gold bricks. I grabbed the biggest one I could find but didn't make it far before Killaree caught my eye. And close by, I happened upon the Stout cheese, which I had yet to try. Soon I found myself walking out with nothing but a backpack full of fine Irish cheeses. I was prepared for disaster. I had enough cheese to last me at least a day or two, at the rate I was going! Luckily for me, my subconscious seemed to know that things were amiss and drove me to buy cheese in preparation for whatever doom was in my future. After all, when it rains it pours...only this time, it was pouring in my basement, as the washer sink was clogged and gushing water all over the cement floor after I attempted to do a load of laundry. Worse still, I had to reach my arm into the unknown depths of the grey murky waters to plunge the drain, disturbing grey matter as it spewed from the drain and rose up to the surface. Ew. After a day that started with a scare and ended with a flood, I thought it only right to spend my Tuesday treating myself to something special. 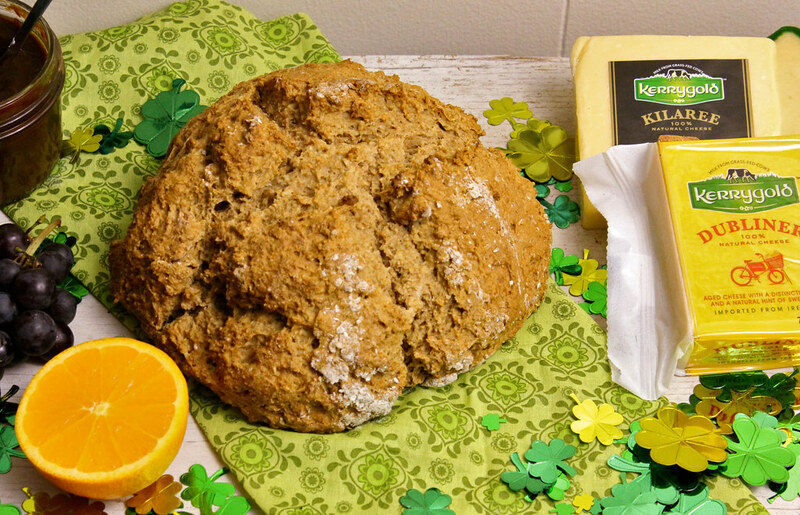 Enter this brown bread recipe plus a few cheeses, butter and some festive decorations courtesy of Kerrygold. As I've mentioned before, living in Ireland for a summer didn't change my eating habits, especially my tendency to stress eat. One of my favorite ways to enjoy all the bakery treats I bought was to create a mini picnic by the water--whether that be the River Liffey or the Galway Bay. My impromptu picnic was set up above the pool of water in the basement, thankfully, but the intention was just the same: to make me pause from whatever chaos I was in the middle of, focus and appreciate what was in front of me. I certainly have a deep appreciation for every element of this meal--from the apricot butter I got at the last food swap, to the sweet Irish butter, to the emergency cheese--sharp cheddars each with their own distinct flavor and, of course, this Irish brown bread. The recipe was given to me my friend Aaron Hastings, who is a great baker and homebrewer. He got the recipe from his mom, who graciously answered all of my questions about the dough's consistency. 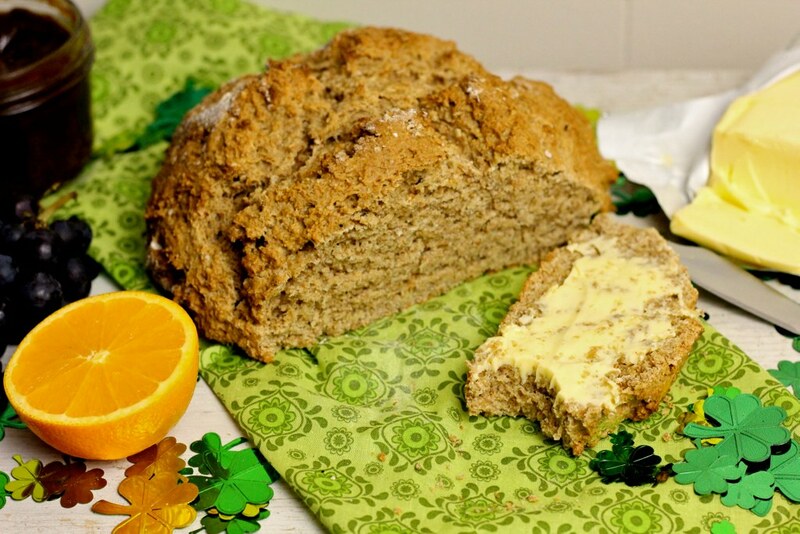 The texture is lovely--a spot on replica of the bread I ate with everything in Ireland. Kelly Vass (kellybakes.com) with thanks to Aaron Hastings & his mom! I got this recipe from a friend I met in Galway and adapted it greatly, omitting several ingredients because I never feel like trekking to Whole Foods for wheat germ and bran. I appreciate how light this bread is compared to other brown breads I've tried with a dense consistency or a rock-hard crust. It was perfection at the first bite! Combine flours, oats, salt, baking soda and brown sugar in a bowl. Pour in the buttermilk and egg. Turn out onto a parchment or silpat-lined sheetpan. Slit an X in the top of the loaf. Bake for 45 minutes and, as Aaron's mom says, "Take out of oven and tap the bottom - if it sounds hollow, it's done!" Serve with salted Kerrygold Irish butter. **Disclosure: I was given three coupons, each for one free Kerrygold item--either cheese or butter--valued at $7. I used each to buy cheese, but bought the Kerrygold pure Irish butter myself, because well, I love their butter and I love their cheese (I just love free cheese more). So, as you can tell, I was given free coupons, but the opinions are always my own (especially when it comes to cheese).